Visit NRS's HydroSkin Capri page. No matter what kind of water you're on, these HydroSkin capris from NRS will become an essential piece of your paddling gear. Designed for women the HydroSkin(TM) Capri pants offer unmatched fit and range of motion. They're warm when worn alone, and fit comfortably under another thermal layer when things get really cold. With a shorter inseam, these Capri pants are ideal for shorter women, or taller women who want a little leg ventilation on warmer days! Cut specifically for women, the HydroSkin Capris are a fashion statement even on the water.Updated with a higher waist line for a snugger fit while in the water.ThermalPlush(TM) inner lining increases insulation, repels moisture and dries quickly. Titanium laminate adhesive aids in body heat retention. DWR coating causes water to bead and roll off. In the NRS Women's Hydroskin Capri, rough waters won't trouble your legs. Four-way stretch fabric and four-panel design give you unrestricted range of motion, and a high-backed waistband keeps sensitive skin covered when you're sitting down. Soft ThermalPlush lining feels sweet against skin, and keeps you warm by moving moisture away from your body and drying quickly when wet. The DWR finish helps water bead up and roll of the capri surface before it has time to soak through the fabric fibers. The neoprene core holds heat and resists snags by low-hanging branches, while the titanium laminate offers a bit more insulation without redefining your low-profile look. NRS Women's HydroSkin Capri Kayak Pants - The perfect addition to your gear bag, the NRS womenâ? 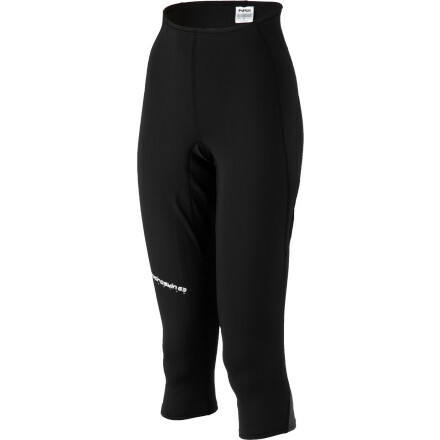 ?s HydroSkin Capri pants are warm by themselves on cool days, and make an ideal mid-weight addition between a thermal inner layer and a windproof outer shell. Terraprene is warmer, lighter, and more comfortable than traditional oil-based neoprenes. PowerSpan adds 4-way stretch for greater comfort and support. A titanium laminate adhesive aids in body heat retention, adding to HydroSkinâ? ?s superior versatility as either an outer or a base layer. The ThermalPlush inner lining increases insulation, repels moisture and dries quickly, while the DWR coating forces water to "bead" and roll off the material. A higher waist line gives you a more secure fit in the water, and the shortened inseam makes these Capri pants ideal for shorter women, or taller women who want a little ventilation on warmer days. Wear them alone in the warmer months or as part of a layering system once the temperature drops. Cut specifically for women, NRS womenâ? ?s HydroSkin Capri pants are a fashion statement on the water, and will become the most versatile piece of kayak clothing you own! The NRS HydroSkin Capri is not available from the stores we monitor. It was last seen January 14, 2016	at REI.